Sri Durga Malleswara Swamy Varla Devasthanams, the chief custodian of Goddess Kanaka Durga temple atop Indrakeeladri, in Vijayawada, has now initiated a programme to propagate Hindu Dharma among the people in coastal villages of Krishna district. Beginning April 27, it will take out a rathayatra from Palle Tummalapalle village in Machilipatnam mandal and conclude it at Avanigadda on May 6. On an average, the ratha yatra will cover about five villages during the ten-day Yatra. According to temple authorities, the focus is on small localities, mostly belonging to dalits and fishermen communities. The prachara ratham is a replica of the hill shrine of the Goddess Kanaka Durga and will have a processional idol of the Goddess. 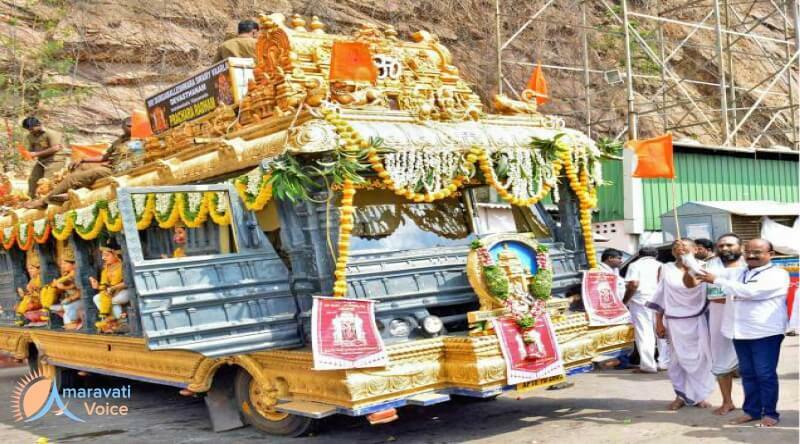 Apart from the usual rituals performed at the temple, the priests and temple employees accompanying the vehicle will explain about various aspects and different rituals of Hindu Dharma.